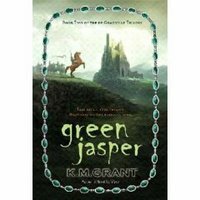 I was tooling around the web and found a new author I HAVE to get from my DS (ha, ha, really for me, but any excuse will do!). 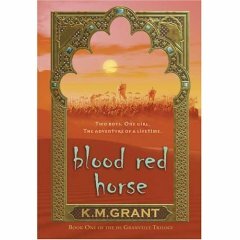 KM Grant has written the first 2 books of the DeGranville triolgy. They look awesome. Which is really, really hard in Katy, Texas! 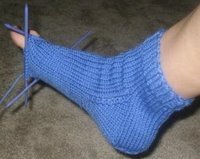 But, I can crochet myself one! 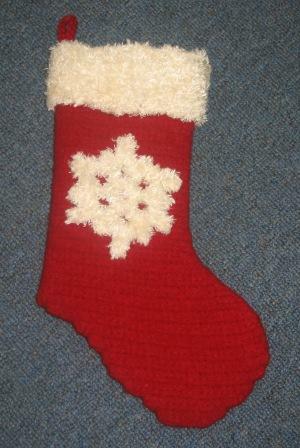 I designed a crocheted felted Christmas stocking for Yarntopia. They will have the pattern for sale and I will also be teaching a class on how to make it as well. This was really the first felted project I have made and boy does Cascade 220 felt up nice and quick. I added the Berroco Chincilla trim after since it states it is dry-clean only on the label. I am getting ready to go to Los Angeles next week but I get to take my mom along with me. We are going to do some tourist-y stuff like Catalina Island and Rodeo Drive. We are the ULTIMATE TOURISTS! lol Any ideas? Let me know so we can check them out. I haven't been sleeping well lately (note the time stamps on my last couple of posts) so Thursday night at about 3am, I started a quick baby gift for one of the counselers at LA Weight Loss that just had twins, a boy and a girl. 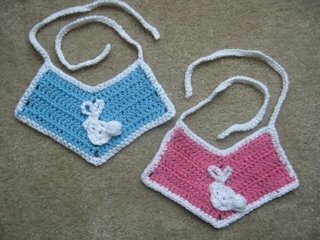 I made them in one of my favorite yarns, Bernat Cottontots, so I decided to call them Peter Cottontots Bibs! PS - I have lost 24 lbs, yeah! If you want a healthy balanced way to lose weight, LA Weight Loss is great. Give them my name if you go, you get credit for referrals (the mercenary me, said that...). They Wanted to be in Pictures! I finally slowed down enough to take some pictures of some of the knitting and crocheting I have been doing! 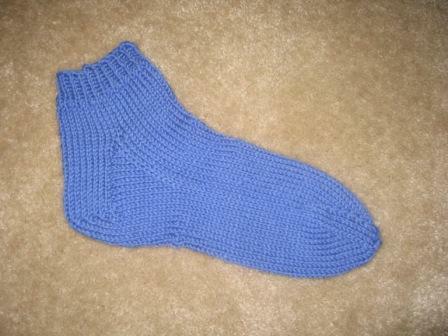 This is from a fun class I took at Yarntopia called Beginning Socks. 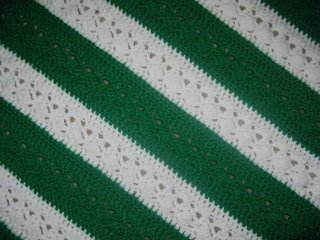 It is done in a worsted weight wool yarn. I am planning for it to be more of a "slipper" for one of my sister-in-law's (it's a secret which one!) for Christmas. 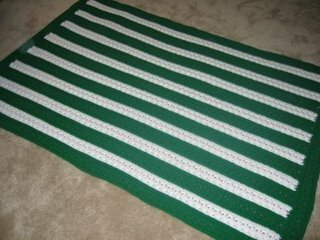 I am planning to crochet a butterfly and attach it to the slipper and then do crewel work to add the path the butterfly took up the slipper. Now I just have to start and finish the 2nd one! 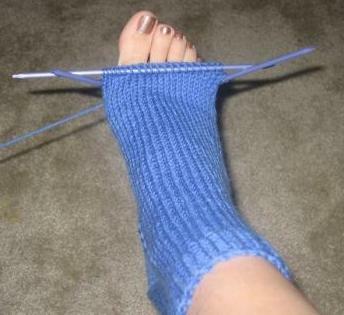 I also took another sock class from Catherine called Magic Loop Socks. I think this might be the method I like best. We started a child's sock, I chose turquoise thinking I was making a baby gift but I guess it will be a big sister gift for the next lucky mom-to-be. Here's what it looks like so far. I am just going to have to guess on the length since I don't have someone specific to measure. 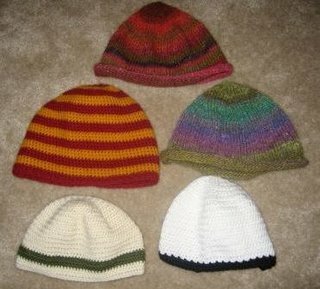 I like to make hats or beanies. They go fast and don't take a lot of yarn. Here are some I have made. Two are knitted from one of my favorite yarns, Noro. I LOVE variegated yarn. These are Noro Silk Garden. Another one was specially requested by my DS in Harry Potter Gryffindor colors in a wool/acrylic blend, and the last two are some of the tons of beanies in Caron's Simply Soft that I have made for my DD, DS, and their friends. In fact, the white one with the black border was just requested by a friend of my DS. I also decided to try felting. 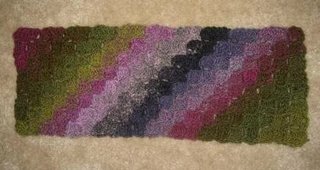 I picked a favorite Noro Kureyon in greens and lavendars and used the Corner Start Stitch to make a felted case for my new toy, a Pocket PC 8125. Here is a "before" photo of it before I felt it. I will take an "after" picture and post it when I get it felted and completed. 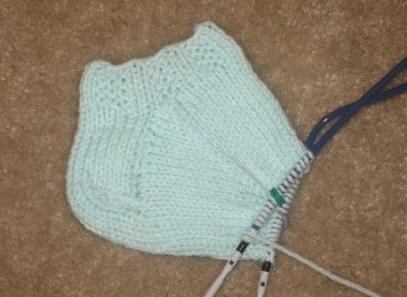 Don't you just love how this yarn looks in this stitch!